This is not a horror movie for those looking for traditional scares. This is a horror movie for those who have become accustomed to the sight of a specter in a mirror or a zombie just around the corner. This is a horror movie with a killer of no less eccentricity than a vampire or a werewolf, only the killer in this film blends in. He’s a next-door neighbor or a familiar face at the neighborhood grocer’s. He’s one of us. And when he’s explored he’s not shown as some unholy or supernatural freak. He is, just like the title, a maniac. Maniac, from 1980, was directed by William Lustig, from a screenplay by Joe Spinell and C. A. Rosenberg. Spinell also stars as the titular maniac, a loner named Frank Zito. Potential viewers might recognize Spinell. A familiar face among New York City based tough guy actors, he had small roles in the Godfather films and a prominent role as loan shark Tony Gazzo in Rocky. There are stories all over the internet about how beloved a personality he was (Spinell died in 1989), and how his friendship with Sylvester Stallone inspired him to guide his own film project. The result is not a film about a lovable underdog, but a film about a serial killer who scalps his victims. As noted above, Spinell plays Frank Zito, a loner whose basement apartment is a den of depravity. The decor consists of tableaus and collages of faces, mannequins who wear the scalps of Zito’s victims, and a shrine to Zito’s mother. Zito’s psychosis is deep and profound, and one he is free to explore at his leisure. There is conflict in his mind. Zito wants to know why he does what he does and why he can’t stop. The film does provide an answer, but it’s a little too neat and tidy. This film is somewhat notorious in horror fandom. Upon its original release it wasn’t submitted to the MPAA for a rating. It’s unlikely that it would have been awarded an ‘R’ without substantial cuts to the murder scenes — one scene in particular. Makeup and special effects were handled by Tom Savini and his crew. It looked like he was given license by Lustig to go as far with the gore as he wanted. It really is spectacular, and quite disturbing. It also fits right into the overall theme of the film. Zito is no cartoonish slasher. On the spectrum of horror madmen, he is much closer to Jame Gumb than Freddy Krueger. Spending time with Zito is an exercise in endurance for the audience. There is never a second where Zito is endearing or sympathetic. He is, from the beginning of this film until the end, a monstrous murderer. Spinell does a very good job with the material. I bought him as a lonely psycho. The moments he spends by himself are a look into the habits of a murderer that could have been as exploitative as the gore, but are surprisingly restrained for how disturbing it all is. The limits of my suspension of disbelief were reached when Zito begins dating fashion photographer Anna D’Antoni (Caroline Munro), but that’s my hangup and not the film’s. This may have been Spinell’s passion project, but it was Lustig’s film. This is a filmmaker whose later career was spent making the Maniac Cop horror flicks. Those flicks are barely passable. But Maniac has long sequences of sheer cinematic brilliance. Early on I was puzzled as to why this film has fallen through the cracks. I was seeing a very hard-hitting and well-filmed exploration of murder. But then this veneer slipped away and the exploitation beneath showed through. 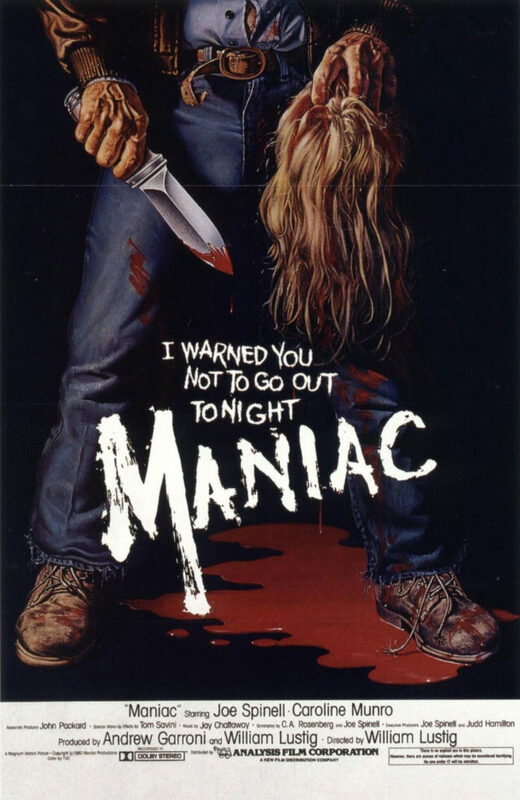 Alternately excellent and then full of schlock, Maniac is a film that, despite how some people feel about it, Lustig can be proud of. For those willing to plunge the depths of the horror genre, it’s a must see. It’s trash and it’s somewhat artful, and it could make a viewer feel guilty for enjoying it at all.